Simplify, streamline and secure your organization's procurement process. 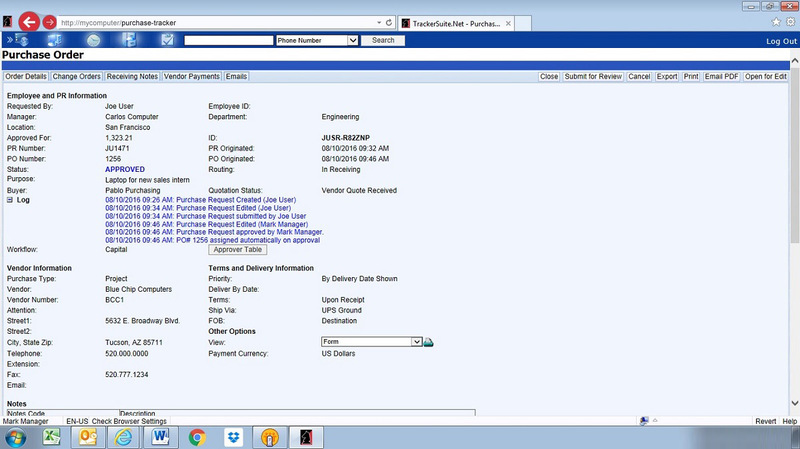 Purchase Tracker is a purchase to pay solution that utilizes Web purchase orders to maximize the efficiency and accountability of your purchasing, receiving, and accounts payable departments, as well as facilitate initiatives such as compliance with Sarbanes Oxley. 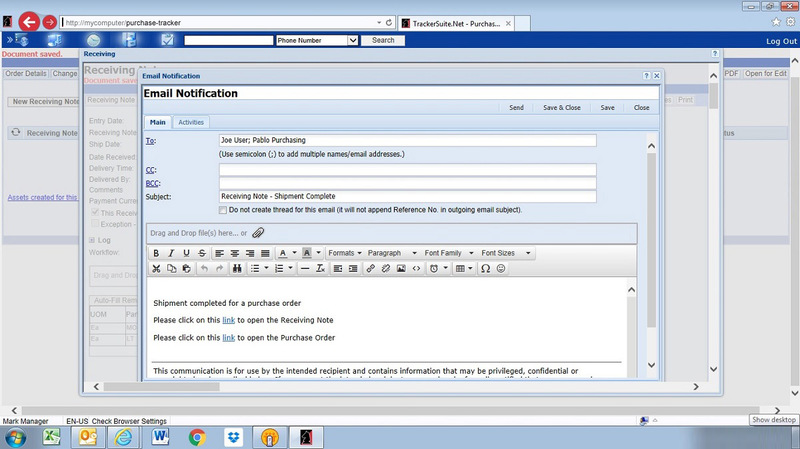 Using Purchase Tracker, users can submit purchase requests via the Web or email. These submissions are automatically routed to a designated supervisor for approval or disapproval, with electronic signatures to track document activity throughout the requisition process. Through this automated approval routing, it provides complete visibility throughout the purchasing process. 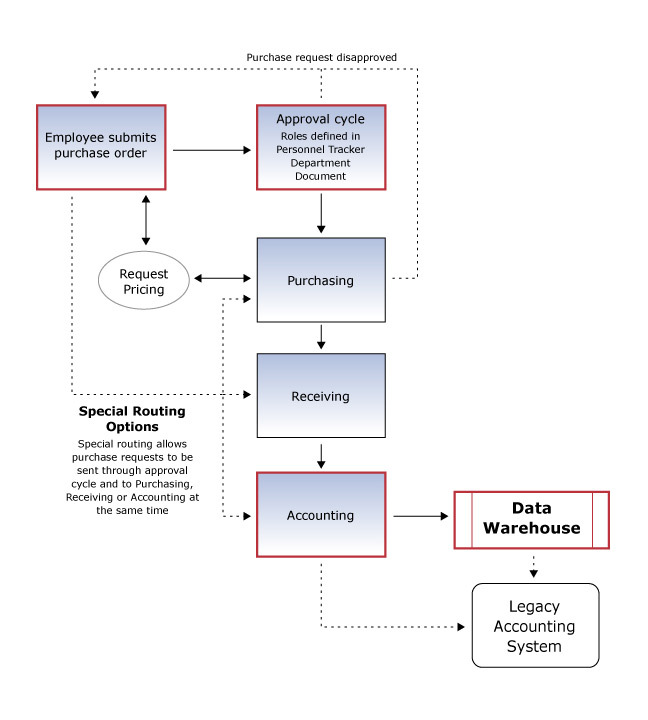 Approved purchase requisitions can be monitored through accounting and on through receiving. Purchase Tracker also manages the Request for Quotation Process with your vendors, Change Orders, Receiving and Vendor Invoice processes. 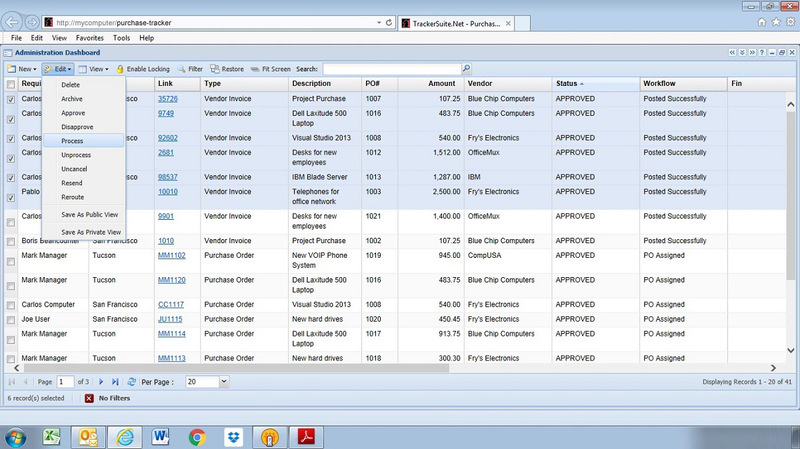 Purchase Tracker integrates with the Tracker Data Warehouse, a Web based reporting engine, ensuring that the most current procurement data is used in compiling financial reports. 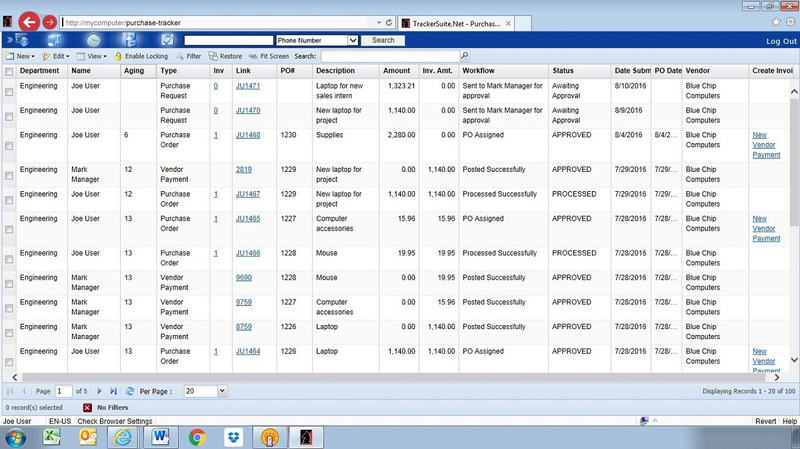 Purchase Tracker can integrate with existing Accounting Systems. 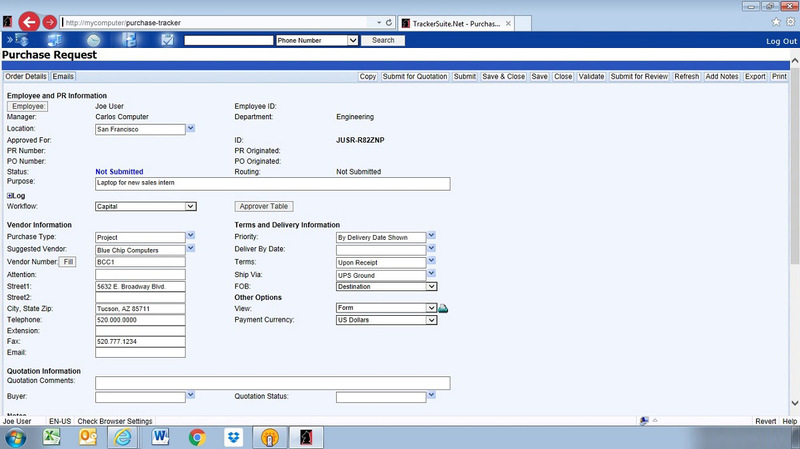 Purchase Tracker provides a role based user interface that simplifies the user experience and workflow. Utilized roles typically include General, Manager and Accounting. Users can submit purchase requests from any location via their browser or even within their preferred email clients. Purchase Tracker supports multiple currencies as well as different "Bill to" / "Ship to" locations. It supports the localization of purchase requests, including dates and numbers. If the purchase request is similar to one previously submitted, the user can copy the previous request into a new one with the click of a button. Purchase Tracker supports a Request for Quotation Process, where multiple vendors can be emailed to request quotations, and will store the responses as well. A Purchase Request may also be generated directly from an RFQ. 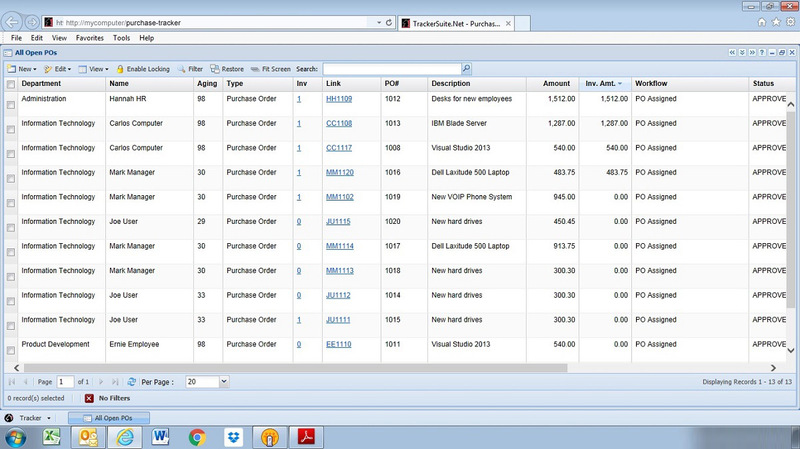 Purchase Tracker also manages Change Orders, Receiving, and Vendor Invoices. Purchase Tracker supports the creation of blanket purchase orders. We have spent a few decades perfecting the art of software design and development. Here are a few examples of Purchase Tracker at work. 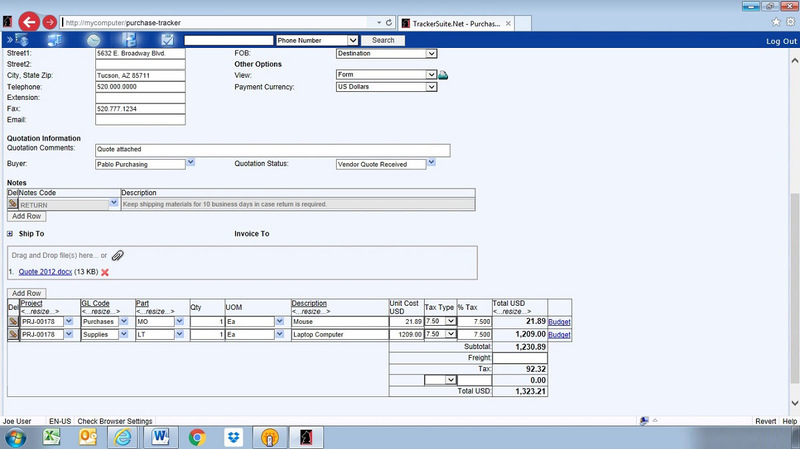 Purchase requests can be managed and tracked using intuitive "In" and "Out" boxes. Attachments, such as scanned estimates or proposals, can be attached to the request. Purchases can be charged by line item against projects, account codes and cost centers. Further purchases can be tracked directly against capital budgets, to better manage budget vs. actual spend. The purchase request form also includes a GL coding section, where the total amount of the purchase can be divided against multiple account codes. Users can charge GL codes against specific tasks in a project's WBS. Purchase Tracker supports a review process, allowing forms to be sent for review prior to submission. Purchase requests are automatically routed through the approval process upon submission. 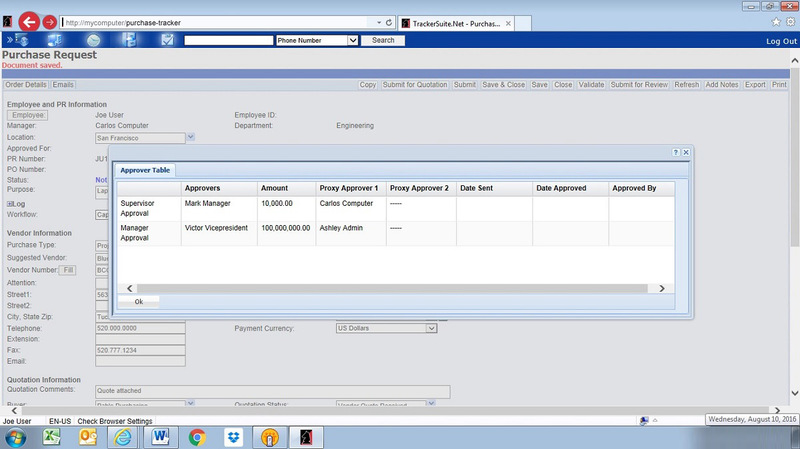 Purchase Tracker allows for unlimited workflow scenarios for purchase order approval routing- by purchase type, department rules and spending limits. Separate approval cycles may be configured for capital items. Each form includes an activity log that provides a time and date stamped electronic signature for each form action, from creation through final processing. 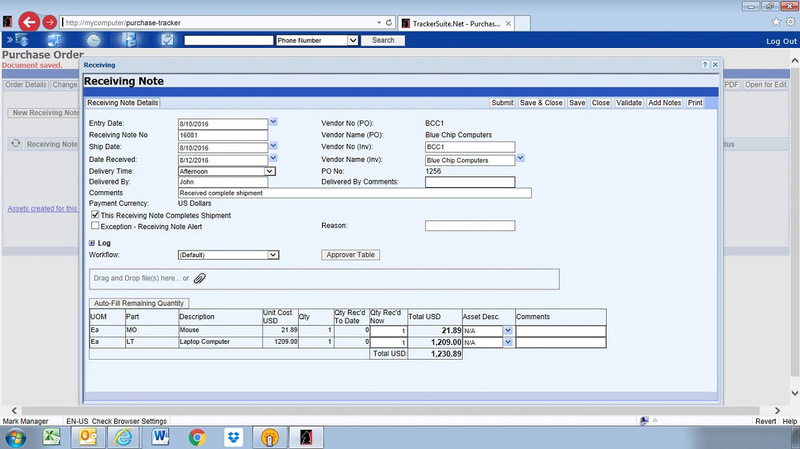 Purchase orders can still be edited and updated after approval by administrators, with a change request function that includes snapshots of each version of the purchase order. It supports the faxing and emailing of POs. 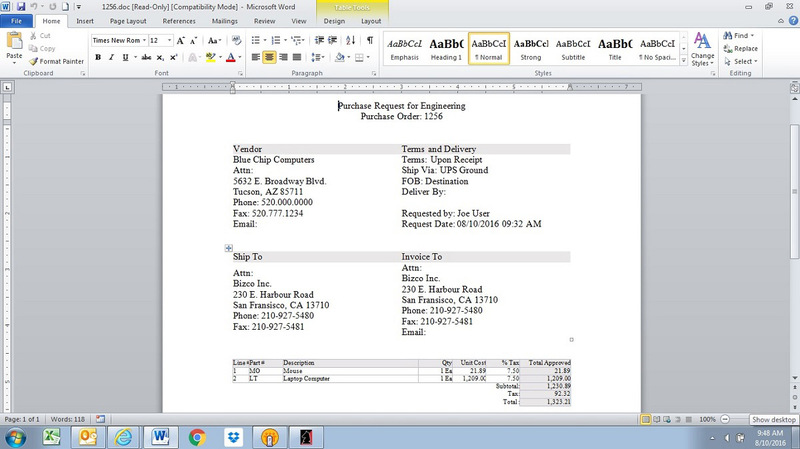 POs can also be exported as Microsoft Word documents or PDFs. 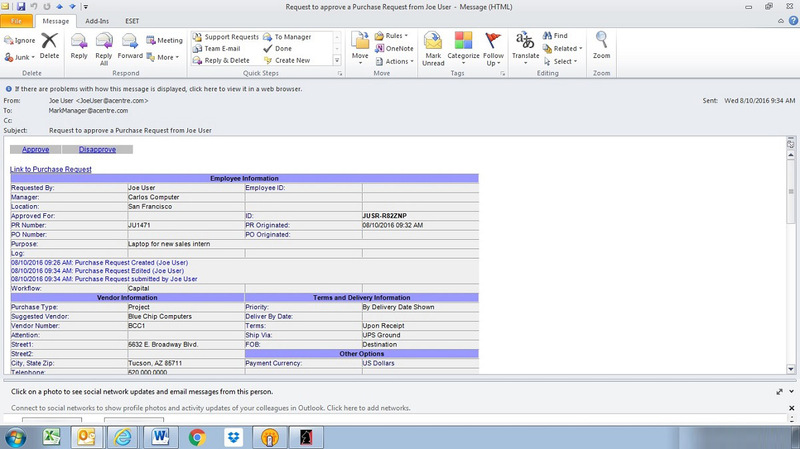 Managers can utilize a PO reporting function to view the approval and financial status of each request. 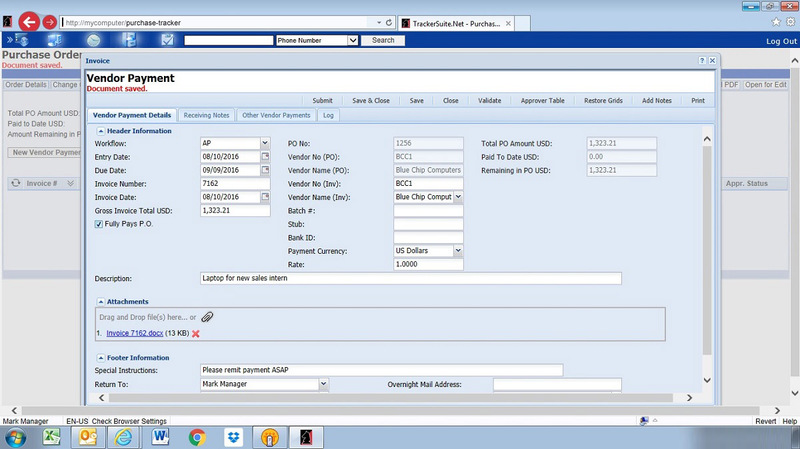 Managers can also track the status of purchase orders in the system using various dashboard views. Purchase Tracker also provides an "Aging" column in Accounting views that show how long purchase orders have been in the system. 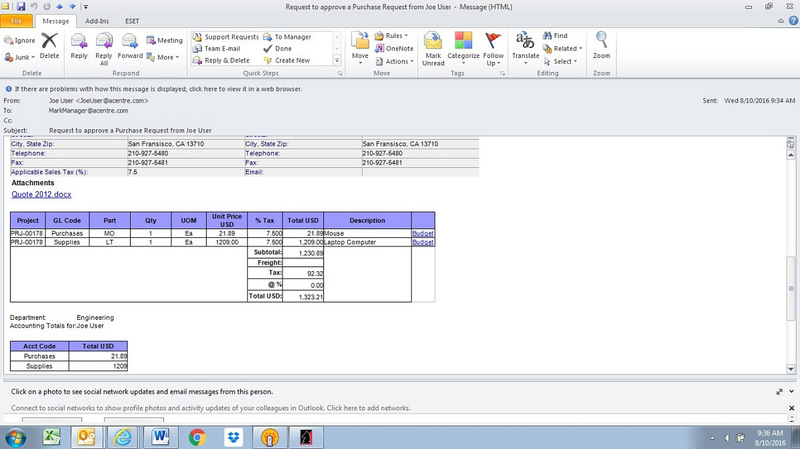 Reports of purchases submitted, ordered, received and paid for by vendor, requester, department, cost center or project. Reports on Requested/ Committed/ Paid Amount. Through spending limits, automated approval routing and electronic signatures, our solutions facilitate purchase requests, increase the transparency of your procurement process and simplify and automate the purchase requisition process.